As a little girl, there were few books I loved better than George MacDonald's classic fantasy, The Princess and the Goblin. I don't know how many times I read and re-read it, but it can't have been fewer than three times, and perhaps as many as eight or nine. MacDonald had the gift in all his fantasies of inventing images so simple and so powerful that they gain an unassailable foothold in the imagination, and the most powerful image of all of them must be that of the little princess who gets lost in the castle where she lives and ends by discovering a wonderful, wise, and mysterious great-great-grandmother living in a distant tower. The fairy ancestress, her splendid and gorgeous apartments, the fact that few but the princess herself know of (or can believe in) her existence, and the princess's adventures under the oversight of this powerful protectress, make the story not just one that every little girl is bound to adore on first reading, but also exactly the kind of fairy-tale GK Chesterton spoke of when he said that fairy-tales give us, not so much dragons, but heroes to fight dragons. I've already reviewed The Princess and the Goblin on Vintage Novels, quite early on, but I've recently had the chance to re-read it, for the first time in years. In addition to the fairy great-great-grandmother and her small protege, the plot also features Curdie, a miner boy who lives near the princess's castle, and the malicious goblins who infest the mines, battle the miners, and ultimately hatch a fiendish plot to kidnap the princess. It's up to Curdie to foil their plans, but not without the help of both the young and the old princesses. I thoroughly enjoyed revisiting this story. In some ways, it was every bit as good as I remembered. The imagery was just as enthralling as every, and I was particularly impressed, this time around, by something you don't often see in Victorian or children's literature: a good balance between innocence and beauty on the one hand, and aggressive, unapologetic courage on the other. Princess Irene has a somewhat revolting habit of talking to flowers, it's true; but she eventually proves to be cool-headed and practical when she's called to undertake a dangerous rescue mission. Curdie, on the other hand, kills monstrous creatures with his mattock and even gets shot by a crossbow on occasion, but he's always kind and gentle to his mother. On the other hand, in some ways, I was able to spot some flaws I hadn't noticed before. I think the most worrying thing was a subtle but unmistakeable theme having to do with unbelief. Irene sees and believes in her grandmother, but various other key characters do not. When Irene wants to blame them for not believing, her grandmother gently reproves her, with the implication that unbelievers are not to blame for their unbelief. Irene sums up her lesson by saying, "So as Curdie can't help it, I will not be vexed with him, but just wait." Curdie's mother, wiser than he, makes similar comments: "I don't blame you for not being able to believe it." This theme, being one of the strongest in the book, and being so contrary to the clear teaching of Scripture (in Romans 1:20, for example), is worth pointing out. That was a disappointment, especially when it's wrapped up in what's otherwise a really delightful story. Just something to be conscious of if you've chosen to read it with small children--which I would definitely recommend doing! Find The Princess and the Goblin at Amazon, The Book Depository, Project Gutenberg, or Librivox. Again, it'd been years and years since I read this book, and again, I found myself surprised by revisiting it in older years. The sequel to The Princess and the Goblin finds Curdie a little older, but not (alas) wiser. 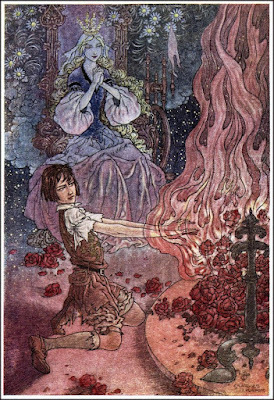 When he carelessly decides to shoot a white pigeon which he should know belongs to the old fairy princess, however, his repentance leads him back to the castle and the tower where the wise old lady entrusts him with a dangerous mission to the town of Gwyntystorm, where the Princess Irene has gone to live with her king-papa. With the help of a band of grotesque beasts, Curdie sets out to discover a plot that threatens both the king's life and his reason. I never loved this book as much as I loved the first one, although it is a good story in itself. On re-reading it recently, I decided that must be partly because of the plot, which is nowhere near as tightly-woven as The Princess and the Goblin, and tends to wander into satire or didactics. That's a shame, for the themes, if a little laboured, are a good deal more sound than in the first book. I particularly appreciated what MacDonald has to say about sin (that unless you consciously struggle against it, you are bound to succumb to it): "There is this difference between the growth of some human beings and that of others: in the one case it is a continuous dying, in the other a continuous resurrection." The whole plot is deeply concerned with these two ways, one of dying, the other of living; Curdie himself is given the gift of discerning who is on which path, and as it's pointed out, while two people may seem to be at the same place in their lives, one may be on the "braid, braid path", while the other may be on the path "so thick beset with thorns and briars". Interestingly, one of the most powerful expressions of virtue in the novel has to do with hospitality, with a corresponding emphasis on the evils of unkindness to strangers. Other sins featured include petty theft, selfishness, and high treason, but unhospitality seems to get the most attention. That really struck me. I don't know about you, but I've not heard a great deal of teaching on hospitality, and most of it seems to focus on having friends around for Sunday lunch--but George MacDonald is talking about what Scripture talks about, which is caring for strangers and travellers, making sure you open your home to them in love rather than treating them with suspicion and distrust. In conclusion, I'd highly recommend both these books. Neither are without their flaws, but both are absorbing stories, a rich feast for the imagination also intended to nourish the souls and intellects of the hearers. Find The Princess and Curdie at Amazon, The Book Depository, Project Gutenberg, or Librivox. What a fun review! 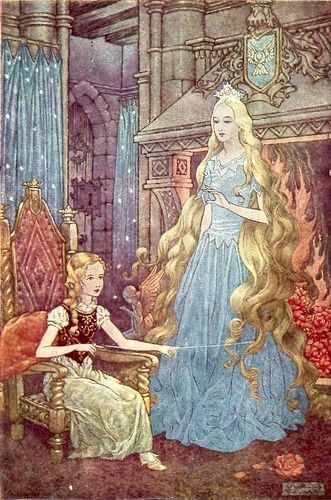 I remember reading The Princess and the Curdie when I was younger, and enjoying it too--though my recollection of it has grown fuzzy, and I only remember a few key points. Interesting to see how MacDonald struggled constantly with theology throughout his books--and sometimes with artistry as well. It's certainly no easy thing to expose your own flaws through your characters. Have you ever had a chance to read any of his realistic novels for adults (besides fantasy and children's novels)? I really enjoyed Malcolm and its sequel The Marquis of Lossie. I think the actions of the characters show a much wiser view of human nature and even salvation than MacDonald's didactic passages ever do. His theology was questionable, but it seems to me that as an excellent writer he couldn't help observing and recording things and people in their true colors. Reminds me of something Chesterton said about Tolstoy, for which I have lost the reference at the moment. Schuyler, you read it when you were younger? What fun. It's such a fun book, I'm sure you'd enjoy re-reading it someday. Jamie, yes, I've read a few of his other novels, but that was years ago, and I only had the Bethany House editions which had been edited. I was able to find "The Marquis of Lossie" at a good price in a closing-down bookshop a few years ago, and I have two others as well, but haven't got around to reading them yet! I really should! I very much enjoyed "The Fisherman's Lady", as it was when I read it. Alison, yes, you should read it! I've never seen the movie, but the book is thoroughly delightful! One thing you should know: The Marquis of Lossie makes a *lot* more sense if you read it *after* Malcolm. I learned this the hard way. It didn't say it was the sequel! It was confusing! But do read them. Announcing WAR GAMES: 2nd Edition!